The teaser line for this review isn’t just a teaser, it truly gets to the heart of what I believe Amir Bar-Lev’s film is all about. I’m focusing on myself and my long hiatus from writing anything about film. What I’m not focusing on is the horrific acts that prompted this documentary to be made. Interview after interview takes place in this film, and just about every single time the sexual assaults committed by Jerry Sandusky are glossed over. Sometimes they aren’t even mentioned. A man’s legacy is mentioned repeatedly, the importance of football to Penn State is driven home, and the quest for closure is touched upon. These are important micro issues within the larger macro issue of what happened in the Sandusky case. But, they are the micro and they are treated by the interviewees as if they are the macro. It’s a deliberate choice, I believe, by Mr. Bar-Lev to shift the focus away from the sexual assaults. He’s not ignoring them because he feels they should be ignored, rather he is shuffling them to the background to allow those being interviewed to impress upon the viewer there proper level of importance. With each interview and talking head it becomes clear that the sexual assaults are but a footnote to those involved in the Sandusky case. Other issues matter more to them, and Mr. Bar-Lev’s camera takes on a pleading nature the longer the film goes. As Mr. Bar-Lev’s camera lingers on its subject it is begging them to address the real issue. The camera stares at Sue Paterno and asks her to not worry about the way in which her husband was fired. A look inside of Jay Paterno is provided when the piecing camera gives him every chance in the world to admit that the Sandusky case goes beyond just Jerry Sandusky. A former Penn State student, Tyler Estright is perhaps the most revealing interview. Mr. Estright wants to discuss anything but the Sandusky case. He dismisses the Sandusky case as an obvious wrong then proceeds to spend the rest of his camera time bemoaning the football program and how they should have immediately returned to treating game day as just another game day because football is what matters. A large number of people are represented in the tone deaf responses of Mr. Estright. The film returns to him time and again, always allowing him the chance to say his peace and to maybe realize that the sexual assault of numerous teenage boys is higher than football on the importance scale. Mr. Estright will have none of it, even going so far as to say that Penn State students destroying property the day Joe Paterno was fired wasn’t a riot, but a protest. Mr. Estright cannot see beyond the bubble that was Happy Valley. 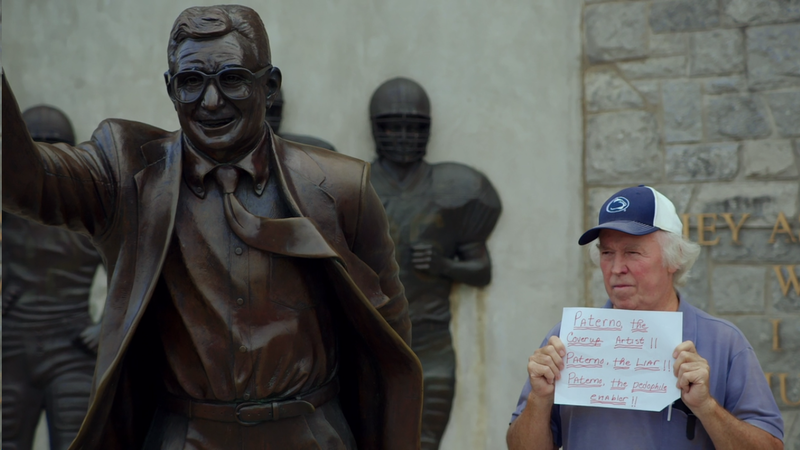 Mr. Bar-Lev never makes any judgement on Penn State, Joe Paterno, or even Jerry Sandusky. He allows the information to flow freely and to the viewer. He sets up his interviews so that those being interviewed can give their side of the story. He allows his camera to record, document, and present. In doing so he leaves Jay Paterno, Sue Paterno, Tyler Estright, and many others to damn themselves. The less time Mr. Bar-Lev spends on the sexual assault cases the clearer it becomes that Happy Valley is still trying to live in the bubble world that once existed. Acknowledging sexual assault is second fiddle to the removal of a halo on a mural, and all the while Mr. Bar-Lev’s film simply presents and allows the viewer to come to their own conclusions. Happy Valley is a splendid film, one that I was not expecting. I put Happy Valley on late at night on a Saturday night, and I didn’t even think I would finish the film that night. An hour and a half later I had finished the film, not being able to take my eyes of of Mr. Bar-Lev’s documentary for a single, solitary moment. By simply presenting information Mr. Bar-Lev has made a documentary that says a lot and never feels ham fisted in getting said presentation to the viewer. I never expected to do a full write-up on Happy Valley, and yet here I am doing as such and here I am focusing on my own writing and the mechanics of a film rather than the sexual assaults. Quite the well-made film indeed. This entry was posted in 2010s, 400+ Word Reviews, Amir Bar-Lev, United States Of America and tagged 2010s, documentary, sports, united states of america. Bookmark the permalink.